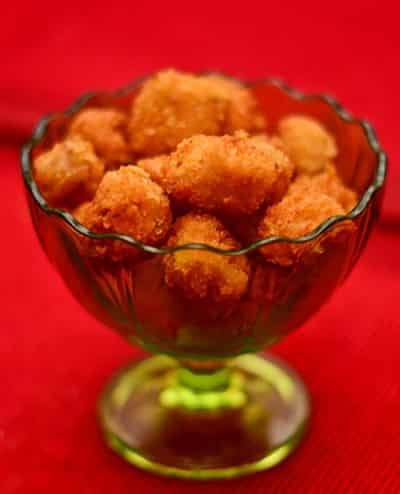 KFC Popcorn Chicken was made to be shared around and eaten with friends and families. This recipe is easy to follow and very easy to batch cook to create as many tasty chicken bites as needed. Top Tip - To cook up more batches of popcorn chicken, all you need to do is double the amount of chicken. Increase the amount of herbs, spices & flour as needed as you go. You shouldn't have to double all of these to make 2 batches as you will get excess which doesn't stick to the first batch. Start by cutting up the chicken fillets into small popcorn sized bites. Soak each chicken piece in the egg for a few minutes. Whilst the chicken is soaking, in a small container add a pinch of pepper, a pinch of salt, paprika, garlic powder, onion powder and the corn flour. Remove the chicken pieces from the egg mixture and leave on a paper towel for a couple of minutes to drain off any excess mixture. Then roll each popcorn chicken bite in the mixture of herbs, spices and flour. Coat each portion well on all sides. Lift each piece of chicken directly from the herb mixture and roll in breadcrumbs. Set each piece aside for a few minutes while you heat the oil. This will allow the bread to stick to the chicken well. To cook we prefer a small-ish table top fryer to allow for an even cook on all sides. Ensure the oil is around 350°F (175°C). Drop in a few pieces of popcorn chicken into the fryer and heat until golden brown on all sides. Turn regularly! We fry each piece for 4-5 minutes to ensure the chicken is cooked through. Remove each batch from the fryer and allow to cool on a couple of sheets of paper, before enjoying!